John F. Kennedy Intl. - Ixtapa - Zihuatanejo Intl. NYC-All Airports - Ixtapa - Zihuatanejo Intl. Liberty Intl. - Ixtapa - Zihuatanejo Intl. Ixtapa, Mexico is a beach resort twinned with its neighboring city of Zihuatanejo, a fishing village that's grown into one of the top tourist destinations on the Pacific coast of Mexico. Between the golf courses, resorts, and hotels in Ixtapa, not to mention the laid-back vibe of Zihuatanejo, and the fine beaches, seafood restaurants, and opportunities for water sports offered by both locales, Ixtapa vacation packages offer something fun for everyone. A vacation in Ixtapa can mean doing little more than sunning on a sandy beach, such as the two-mile-long Playa del Palmar, the main beach of Ixtapa. A wide range of concessions are offered, including massages on the sand, jet ski rentals, banana boat and parasailing rides, and horseback riding excursions. Another popular beach is Playa Linda, where you can visit the Cocodrilario crocodile reserve or take a boat trip from the pier to Isla Ixtapa. This sleepy island has one of the best swimming beaches in the region, as well as off-shore coral reefs where the snorkeling and diving opportunities are spectacular. Head into Zihuatanejo to shop at souvenir stores, arrange whale-watching trips, or pursue water sports on the bay. Visit the Zihuatanejo Museum of Archeology to see ancient Olmec and Toltec artifacts and learn about the region's cultural heritage. With Ixtapa car rentals, you can drive north to the surf spots of Troncones, or south to the picturesque fishing village of Barra de Potosi. In March, Zihuatanejo hosts the International Guitar Festival, which brings guitarists of many styles to town for nightly beach concerts, galas, and special children's concerts. Celebrate Mexico's Independence Day with a parade in September and Dia de los Muertos with a colorful festival in the city's main square on November 1 and 2. New Year's Eve means live music and fireworks as you ring in the new year with a fiesta. 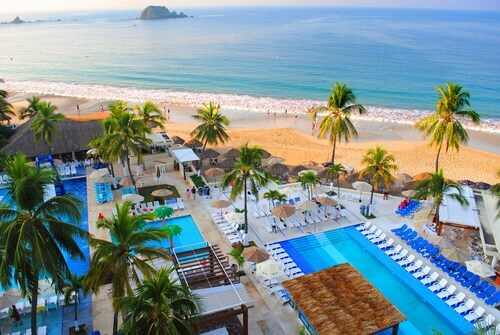 It's time for fun in the sun, so search for great deals on Ixtapa vacations with Travelocity. Download the Travelocity app for mobile exclusive deal and save even more for your Ixtapa getaway. Located in Ixtapa, this beachfront resort is in the city center and within 1 mi (2 km) of Magic World Aquapark and El Palmar Beach. Marina Ixtapa and Ixtapa Golf Course are also within 1 mi (2 km). This resort, accessed by private hilltop entrance, sits on an exclusive Pacific Ocean beach, minutes from Ixtapa's shopping and dining, and 3 miles from Zihuatanejo, Mexico. 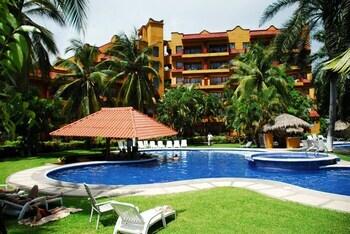 Nestled on the beach, this Ixtapa resort is within 1 mi (2 km) of Delfiniti and El Palmar Beach. 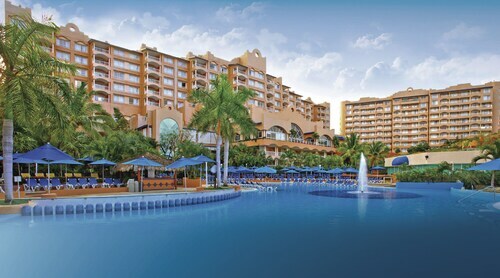 Marina Ixtapa and Magic World Aquapark are also within 15 minutes. 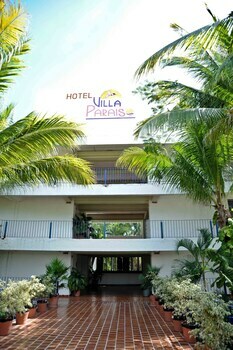 Nestled on the beach, this Ixtapa hotel is within a 10-minute walk of Quieta Beach, Linda Beach, and Ixtapa Island. Varadero Beach and Marina Ixtapa are also within 6 mi (10 km). 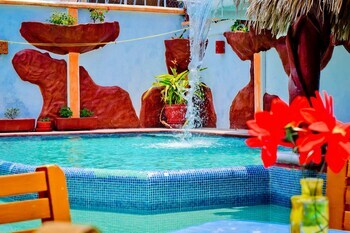 This family-friendly Ixtapa hotel is within 1 mi (2 km) of Magic World Aquapark and El Palmar Beach. 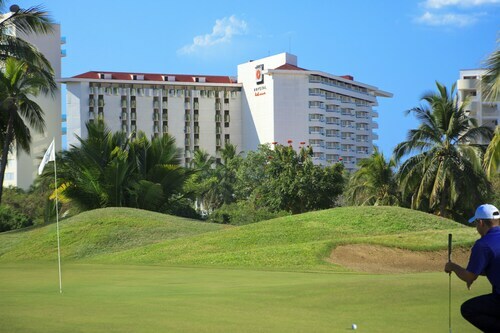 Delfiniti and Ixtapa Golf Course are also within 1 mi (2 km). 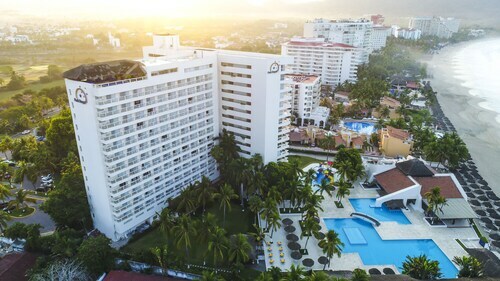 Located in Ixtapa, this beachfront property is connected to the convention center and within a 10-minute walk of Cocodrilario, Ixtapa Island, and Linda Beach. Sacrificio Beach and Coral Beach are also within 10 minutes. 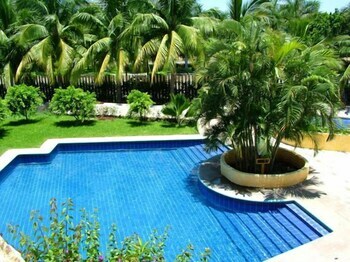 Nestled on the beach, this Ixtapa property is within 1 mi (2 km) of Magic World Aquapark and El Palmar Beach. Ixtapa Golf Course and Delfiniti are also within 15 minutes. Located in Ixtapa, this beachfront property is next to a golf course and within 1 mi (2 km) of Delfiniti and El Palmar Beach. 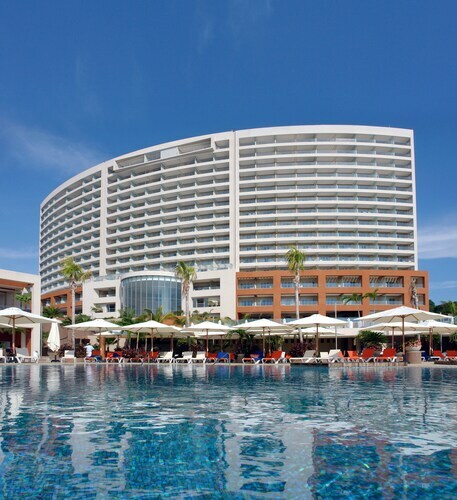 Marina Ixtapa and Magic World Aquapark are also within 15 minutes.